Localmedia reported today that school officials in an eastern PA town have solved a two-year old major conundrum... how to stop male students from intentionally clogging up the toilets at an area high school. To remedy the situation, the decision was made to have males students sign out the roll of toilet paper.Principal Thomas Smith says that's helped solve a major problem, while parents are protesting that some students are toembarrassedto have to check out the roll and instead are going home 'sick'. The school denies knowledge of such problems as reported by parents. Principal Smith - This is your idea of how to solve a problem? This is like a bad joke. Is your job is to prepare youth to function in the adult free world or run a penitentiary? You are using completely inept, outdated, dictatorial regime like tactics that promote rebellion and lack of respect, and frankly - you must surely be the laughing stock of the Mahanoy Area High School football team. In the two-years the problem has been going on, how many anonymous student satisfaction surveyshave you issued and analyzed and how many student focus groups have you held to find out why you have angry male students and why they are acting out in this way? Clearly there is an underlying problem with your school culture that needs to be addressed. Slapping on a sign out the toilet paper band aid might keep the toilet unclogged temporarily, but it isn't a long-term cure for the underlying issues rotting away your internal plumbing. On top of it all, now that it has hit the media you haveembarrassed your student body. This is what the class of 2013 is going to be known for forever. What's wrong with you and your staff for stigmatizing the entire class like this? It's likely a few disgruntled students - why does everyone have to be degraded? No one should be degraded. Perhaps you have never worked outside of the public school system - in a workplace, where management is accountable to the employees, clients and vendors for internal and external customer service. Maybe you should consider a working partnership with SHRM of Eastern PA, to request a task force of HR managers to come in and diagnose your cultural strife. They'll crack the code and then come up with areas of opportunity for you and your staff - not your students. 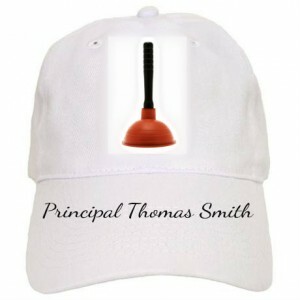 Principal Smith, your students look to you to be an adult role model -instead you are simply acting like the King of the Crapper. It's time to get with the program and make positive change, not sign out toilet paper. If you don't act in a positive and appropriate way, I would be willing to bet you'll be wishing clogged toilets were your only problem as your institution continues to spiral down the drain. If you can't figure it out let me know. I will give you a no cost 30 minute consultation. On second thought, make it 60 - I love working with youth. I wonder if the boys will consider bringing their own TP in from home? If so, this whole sign out process won’t work anyway. If it was my son, I’d send him in with his own. Nice write-up Karla, and I agree 100% that this issue has more to do with organizational culture than it does “TP”. By the way, I’m wondering what the price of “black market TP” will be in and around the high school. Note for all you budding young entrepreneursin the Mahanoy area: opportunity is a-knock’n. This is ridiculous! I’d have my kids bring in TP from home, certainly. I wonder if there isn’t a better way to deal with it. However, if the toilets are being intentionally clogged, something needs to be done. The first thing that came to my mind was the whole community service thing where people/groups adopt a portion of a road or highway and ensure it stays clean. I’m not sure exactly how it would be done. In any case, that principal deserves a “dumbass” award. Guys I would be wrapping TP around my waist and shoving it in pockets before I would go sign it out. Not so much out of embarrassment but out of protest. Dumass award is right @Renee Hendricksand @genagrippaI agree – this could spark madentrepreneurialskills! @Michelle DaviesYou are right – this sign out process won’t work!